You’re looking for quality entertainment… and you’ve found it. 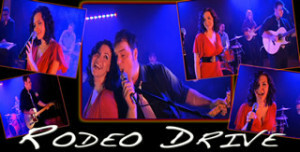 From top 40 dance tunes to country, classic rock and R&B; Rodeo Drive is a top shelf group that delivers excellence. They sing and perform at a level that most hobby bands will never see…and with a musical lexicon that spans several decades; they are able to cover a wide variety of territory and always pack the dance floor. The members of Rodeo Drive are stellar performers and they excel in providing you with music that is exceptional for listening, dining, dancing and having a real good time…..could be because this is what they do for a living…This is a first class group of professionals that travels easily and provides top notch sound and light production at no extra cost. They are the perfect answer for those who want a big sound that is custom made for their event. Any style, any dress code. Find out why corporate clients like Harley Davidson, IBM & ABC as well as countless brides and groom call on “Rodeo Drive” when they want to have a wonderful, memorable occasion.